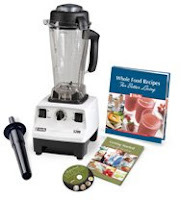 I have been wanting to buy this blender since I saw a live demonstration in one the Women's show held in Raleigh NC. I was such in awe when the demonstrator made a sorbet that include vegetable as one of the ingredient. It tasted so good that I couldn't even tell there was a veggie in it. Hmmm...perfect time to slip some veggies for Isabel. She would not even know it. Perfect machine for making pizza dough or to grind your coffee or other herbs. It also make soups. Personally, I really like the blender. It had a lot of features that I am planning to get rid some of my other small appliances. Just to save some space in my counter and get rid of clutters and those annoying dangling cords. I am almost done with my 2 week detox program. I can't wait to use this blender and enjoy fruit and veggies smoothie . Yumm! Ate if you are going to throw away some of your small stuff, you can throw it away here in Az hehehe. This blender ate is a good idea for picky kids sa pagkain.